El Cid: God's Own Champion, by James Fitzhenry relates the heroic stories of sanctity and success in battle against God's enemies in Catholic Spain! I was thunderstruck to find that this contemporary writer wrote a fast action, high stakes, story about a Catholic hero with no innuendo, warped perspective, or false ideas of the Catholic Faith. Jim keeps you sitting on the edge of your seat, "What's coming next?!" The Cid is a giant in the list of Catholic heroes and I think that every Catholic high school student would be inspired by his story. Do you know his story? Are you tired of the endless books that tell the story of little bad boy runs away from home, does something bad and becomes a saint? James Fitzhenry, owner of Catholic Vitality Publications wrote El Cid: God's Own Champion to meet the need for good Catholic history books. The true story of the Knight of Vivar is an inspiring biography about an extraordinary Catholic knight in Spanish history, "chosen by God to save his nation from Islamic aggression." This is a great book for giving as a gift or for using in Catholic high school curriculum. "The life of Rodrigo Diaz stands out in the history of Roman Catholic Church heroes as one of the most blessed and courageous knights in Catholic history. He is considered by many as one who is among both saints and soldiers." 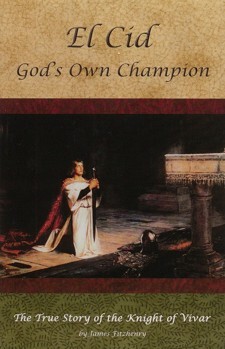 You may buy The Cid: God's Own Champion and other new and used Catholic books at Amazon here. Catholic Vitality Publications offers these Catholic living history books about saints and soldiers. Their Learning to Love God, is a children's book with 49 beautiful color illustrations to inspire your child to a greater love of God! "The purpose of this book, an entirely new creation, is to present God to young readers to make Him known and loved. This spiral bound book is child-friendly with large print, plenty of white space, color drawings that communicate the sense of the sacred, and is printed on heavy stock." or by going to Catholic home school book providers like Amazon's New and Used Catholic Books, Emmanuel Books, or Lepanto Press. El Cid was an exciting story and well written. I did not know about The Cid before I read it. It was one of the best books that I've ever read and it had a good history of Spain. I didn't realize how hard it was to win the country back from the Moslems. I'm reading Saint Fernando III now and enjoying it.